In fact, I would say Halloween and Christmas are tied for me. 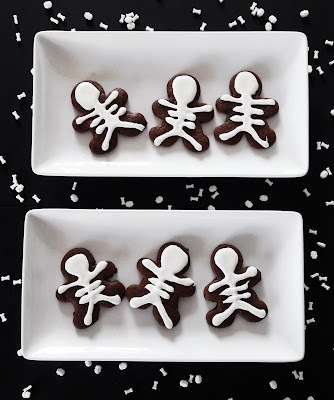 So, I decided to combine them with these super cute and easy skeleton gingerbread cookies. 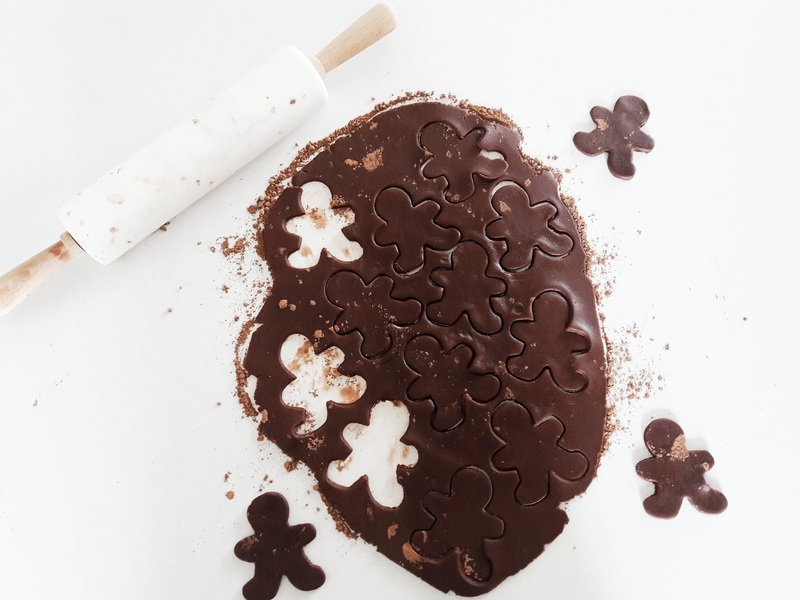 I had never made a chocolate sugar cookie before so I decided to turn to one of my favorite baker's recipes. In a large bowl, beat butter until softened. Add eggs one at time beating well after each addition. Mix in the vanilla and almond extract and mix until well combined. Slowly beat in the dry ingredients and mix until well incorporated. Split dough in half and shape into two disks. Wrap the disks in plastic wrap and refrigerate for at least one hour. Roll out on a clean surface sprinkled with cocoa powder. This will keep the dough dark in color and help it not to stick to any surfaces. 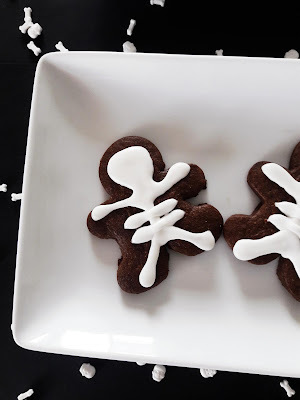 Cut your dough into shape, using a gingerbread cookie cutter. Place onto a greased baking sheet. Freeze cookies for 10 minutes to help them keep their shape. Using white royal frosting pipe a round head at the top of the cookie. Add a line in the center of the cookie from the head to the bottom. Add arms, legs and two ribs. 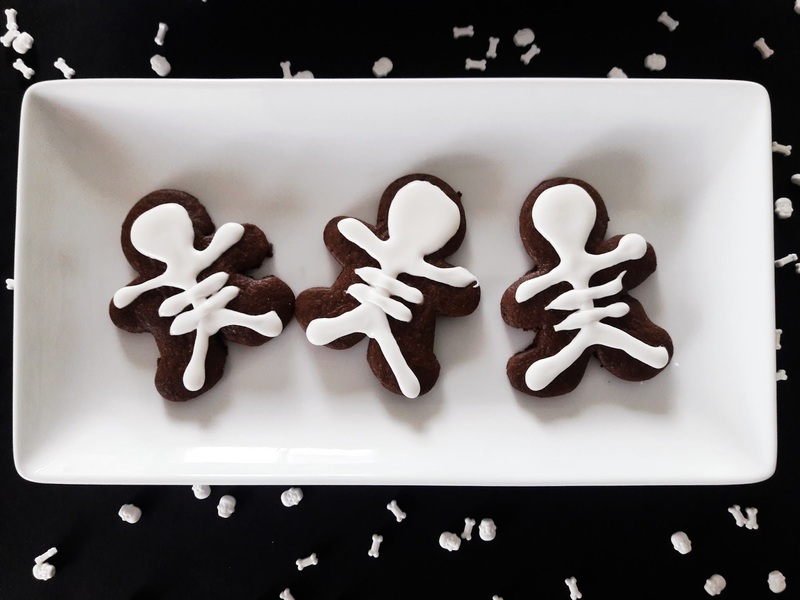 I love how these cookies turned out. They were simple to make but are so much fun. And I love to have another excuse to use my gingerbread cookie cutter. I am so excited for Halloween!